Most of the places I’ve featured on here recently have been fairly mainstream, so I’m going to remedy that now with a hefty dose of quirk. After spending the night in Tetbury (and arriving too late to see the Police Museum and their collection of restraints, much to my sorrow), we drove up to Birmingham. The Pen Museum wasn’t on our initial itinerary, but some of our original plans fell through, and we were looking for other unusual attractions in the city when we came upon the Pen Museum. 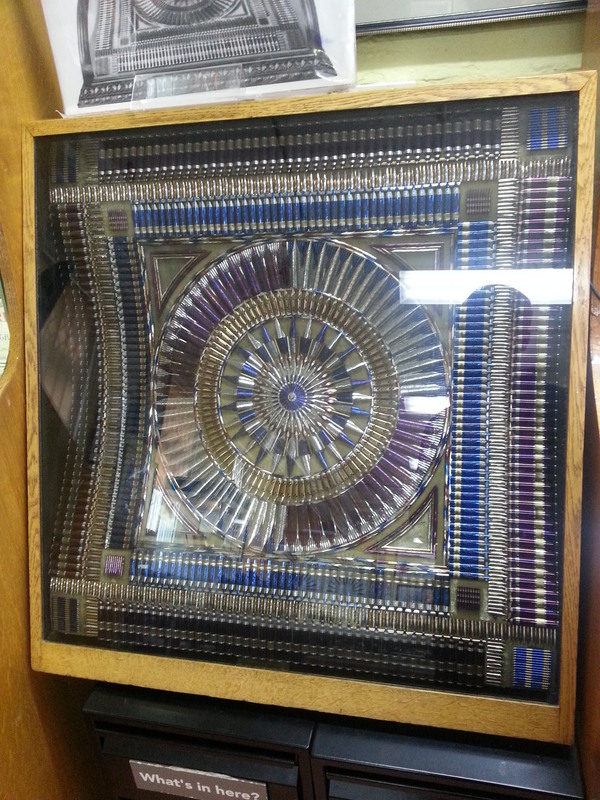 I joke around about wanting to visit the Pencil Museum quite a bit, so a Pen Museum seemed like a good alternative. Did you know that prior to the advent of the biro (ballpoint pen), Birmingham was the centre of the pen industry? 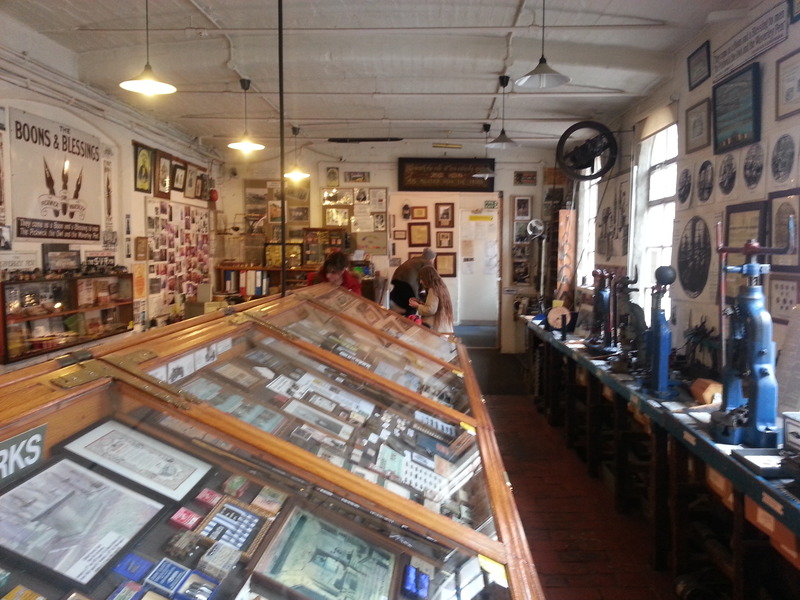 You’ll learn all this and more upon stepping through the gates of this superb little museum. The pen museum was free, which was surprising, and amazingly nice, as I think they would certainly be justified in charging a modest admission fee. When we first walked in, it appeared that the Pen Museum was concentrated in just one room, which I didn’t have a problem with, as that room was crammed full of display cases and pen-making machines. However, we soon found out that there was another, even larger room in the back, thanks to the very eager volunteer who came over to tell us about the museum when we arrived. 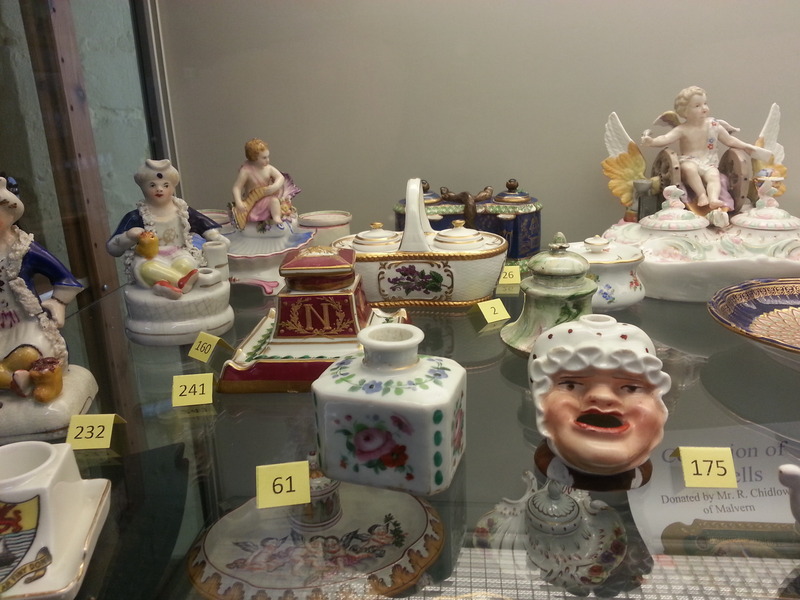 The volunteers were the usual sort of passionate eccentrics you often find in specialist museums, which I think is lovely. I always love to see people who are really intensely into some obscure subject, and I sense that I’ll end up as one of those eccentrics myself in about forty years time. I didn’t ask many questions, mainly because I was a little overwhelmed at the sheer volume of pen paraphernalia, and I didn’t feel I knew enough about pen manufacturing to ask an intelligent question, but if you do have one, these are the people who’ll have the answer. 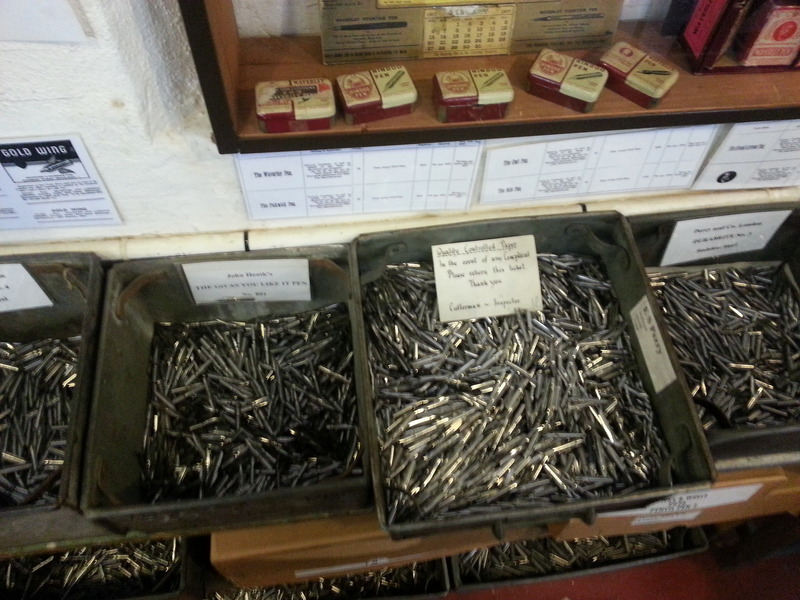 The front room housed most of the actual pens, and had buckets of surplus nibs just hanging around on shelves. They also had packaging that the various pens came in, including one for the “devil’s own pen,” which was a cleverly the model for lefties, due to the traditional association of the left side with evil. One wall was lined with the pen making machines, with signs explaining each step in the pen making process, and accounts from children who had worked in the factory during the Victorian era. They also had a small collection of Braille slates, which I thought was cool since Mary Ingalls (yes, Little House again) is described as using one, and it was nice to see the mechanics of the thing myself. They had a little mock schoolroom set up in the alcove for children to practice their penmanship, which we passed as we were directed into a separate room at the back of the building. A man emerged from the depths of the pens, and offered to play us a short video on badge making, to go with an accompanying case of badges. We acquiesced, as you do, and the video provided an unexpected spot of humour when one of the workers was describing the badge making process: Worker, “And now, we take them for litching.” Interviewer, “Litching?” Worker, “Yeah, where we litch them.”??? So I still have no clue what litching is, but it was pretty classic. I was especially keen on this room because they had interactives, and I love activities, particularly when there are no children around so I don’t have to be polite and let them have a go first. 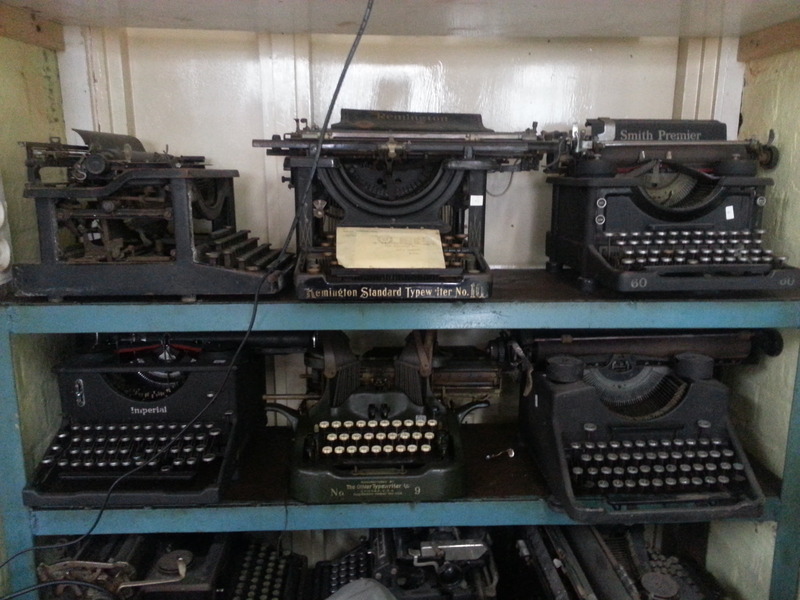 There were a bunch of old typewriters set up to type on, which was so much more clicky and satisfying than a computer; and a table full of pens, ink, and paper, so you could try out your best handwriting. I learned calligraphy in elementary school, and I obviously retained none of it, since I could only get the pen to write in a weird skinny line, though I did manage to smear ink all over my hand. They also had a cool machine where you could see how fast you could stamp nibs, and I completely failed (the man working there helpfully informed me that all the children finish with ten seconds to spare, which made me feel even better about it), but I’ve always known I have lame reflexes, so no surprise there. There was another charming video in the calligraphy area, with a few elderly women describing working at a pen factory, and the one old lady was awesome. She told some story about stuffing a banana with cotton wool to trick her boss, which cracked me up since she was in her 90s and adorable. 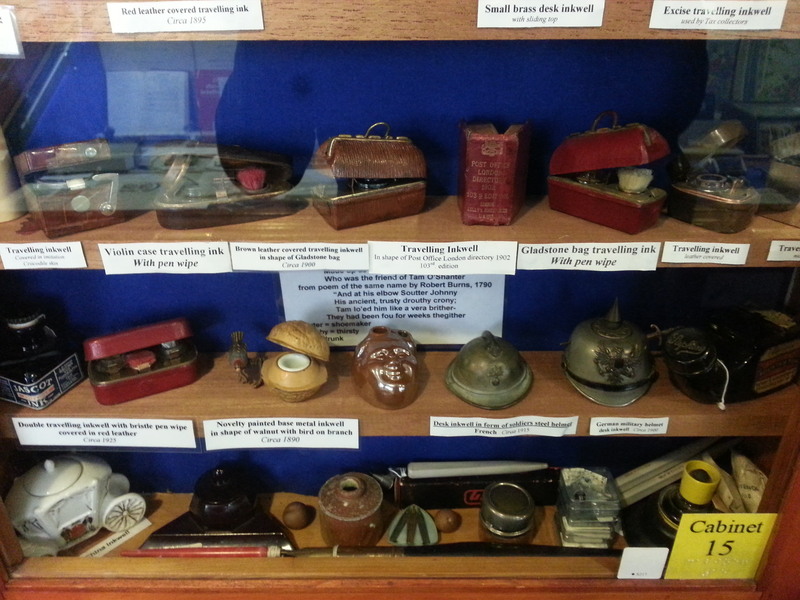 The rest of the back room was more cases packed with pens and pen accessories, like blotters and inkwells. Almost everything in the museum was meticulously labelled, so if you actually stopped to read everything, you could pass quite a bit of time. Foolishly, we had anticipated it not being that great, so we only paid for 90 minutes of parking, but in the end, I had to be dragged out, since there was still so much to look at. Bearing in mind that this is coming from a person with no particular interest in pens, believe me when I tell you that this place is incredible. It’s a very old-fashioned style of museum (no computery things here, obviously, as that would interfere with the pens), and I adored it. Please come here if you’re anywhere in the area, and make sure to leave a donation if you can, because this place deserves it. They have great volunteers, and everything has been lovingly curated, but it seems like the people running it aren’t exactly getting any younger, so it would be a shame to see this place close. Oh my goodness! My uncle in Germany would love to visit this place, he’s so proud of his pen collection! This place sounds really interesting! 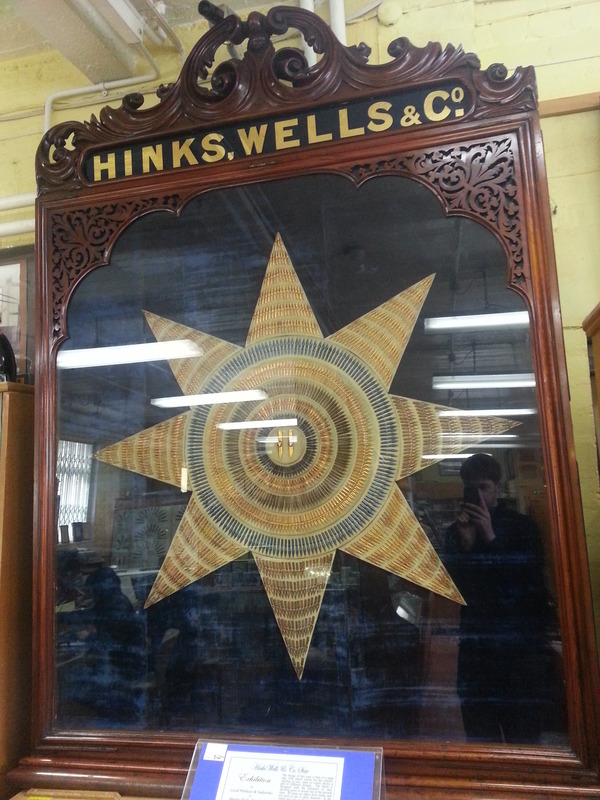 Quirky museums are the best. And you know good museums, Jessica. Thanks, I like to think so! Though I would imagine not everyone would be into an absorbing afternoon of pens. I love the old typewriters. I have a beautiful oil painting of an old typewriter in my living room. They are so charming, especially when the keys go wonky.